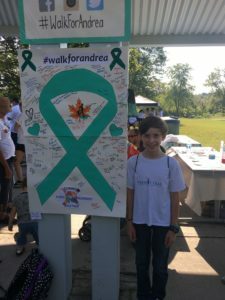 A few weeks ago, we attended the Walk for Andrea to benefit Sick Kids Hospital Food Allergy and Anaphylaxis Program in Toronto, Canada. 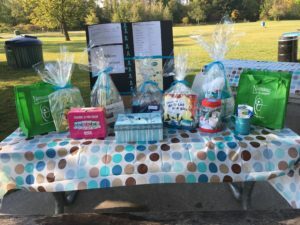 The Turn It Teal project has so much support from our friends up north that when we had the opportunity to meet some of them, and to help spread the word about what we do and more importantly WHY, we knew we had to go. 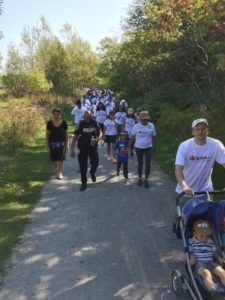 I have to say the walk committee and volunteers did an absolutely amazing job at organizing the walk and it was truly a beautiful event. The TealFamily with the walk organizers. We happened to bump into them at our favorite Toronto eating stop- Sorelle and Co. They were a Teal walk sponsor. There are so many lessons we want our kids to learn when we first find out these little people are coming into our world. We want to teach them things like how to walk, speak, tie their shoes. Most of us strive for more than that though. We want them to become happy and productive members of society. We want them to be loving, compassionate, empathic, and all-around awesome people. I believe that is what all of us want for them. For kids with some added excitement in their lives, things that seem pretty basic may not be. Walking may be difficult because of muscle issues. Speaking may come later or perhaps not at all. Feelings may be overwhelming for them and difficult to manage. Going out to eat may entail many phone calls and workarounds. Things that may seem simple for some are not so for others. That is why finding your “people” is so important, no matter the condition you manage. There are things that parents who have kids with some challenges have to work a little harder at, and the kids too. Finding those who get your struggles and your trials can truly be a lifeline when you need it most. Getting out into the community and hearing what others are dealing with, or helping them when it’s something you have already been through, all these things help our community and our kids. I love when TealKid can speak to a 5-year-old, show the kiddo he’s wearing his auto-injectors, and the other kid sees that they are not alone. That there is this “Big Kid” who is just like them. Seeing him take on the role of mentor was something that I will forever be grateful for. TealKid got to meet CAI founder Debby Bruce’s son. I pulled him aside and explained that he too had allergies. Seeing a young adult who also manages life-threatening allergies was something he hasn’t seen a lot of. We’ve found that as he’s gotten older, he isn’t one of the lucky ones who has outgrown things. He seems to be in this odd stage where many groups cater to the younger kids and kind of leave our tween floundering. These kids who are entering, statistically, the most dangerous years of their lives with regard to allergies, are kind of left out in the rain so to speak. Seeing a young adult was very important to him. Our kids need that. We need to be able to see these young adults and to get them to speak to our kids about things like self-care, bullying, preparing, and always carrying epinephrine with them. 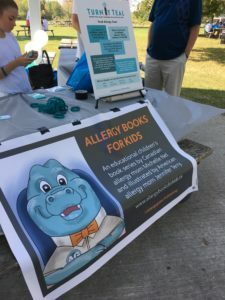 Meeting AllergyBites founder Kathleen and Allergy Books for Kids author Michelle Nal was exciting for us too! 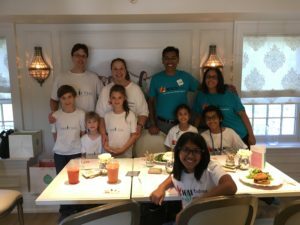 We have been chatting with them for a long time and it was so nice to finally get to meet in person and share our allergy family love! Hypefoodie was also there as well! I know I’ve talked about finding your tribe, and it is so important. Not only for we caregivers, but also for these kids who are growing up. We all need to remember where we came from. The fear. The worry. The dread of another birthday party. And then we move forward to the life lessons they need to function in the adult world. It’s never too early to help them find their tribe.